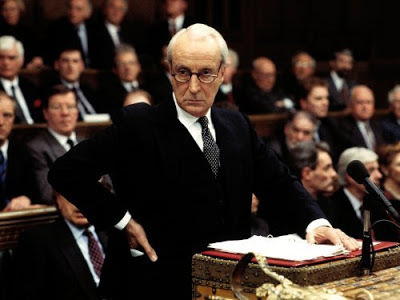 Ian Richardson as Francis Urquhart MP, at the despatch box. PLOT SUMMARY: Conservative Party Chief Whip Francis Urquhart (Ian Richardson) continues to seceretly undermine the Prime Minister Henry Colingridge (David Lyon) by planting tabloid stories attacking his brother; leaking confidential party polls showing how unpopular he is and putting the blame on the Party Chairman, Lord Billsborough (Nicholas Selby); and suggesting to the Foreign Minister Patrick Woolton (Malcolm Tierney) that he might run. He sets Woolton up for a fall by planting a bug in his ministerial box, and forcing Roger O'Neill (Miles Anderson) to pimp out his lover Penny Guy (Alphonsia Emmanuel) to Woolton. Finally, the financial scandal Urquhart prepared for in the previous episode comes to fruition, implicating the Prime Minister's brother, and leading the Prime Minister to resign. Urquhart continues to brief Mattie Storin. His wife, Elizabeth suggest to Francis that to be sure of Mattie's trust, he should sleep with her. Mattie, who has an Elektra complex, is open to his advances. COMMENTS: Episode two is set almost entirely at the party conference, and shows the party at its most Machiavellian. Urquhart is masterful at making the marionettes dance, and we enjoy his mastery. It's a lot more obvious than in the remake, where we gather slowly that Underwood is, via Stamper, pimping out Rachel. This version is far less apologetic and far less mysterious. Underwood is hands off, whereas Urquhart listens into Woolton shagging Penny on his headphones. It strikes me that in contrast to the remake, we don't actually see Urquhart whip backbenchers to support a bill, and that's rather a shame. I actually like the idea of seeing Underwood doing his day job, and passing legislation. Still, there's much to enjoy here. Mattie gathers strength and gumption in the face of her story potentially being spiked. I particularly enjoy Urquhart's taxonomy of the conference: "A party conference can be many things. A show of confidence, an agonizing reappraisal, or, as in this case, a series of auditions by pretenders to the throne, while the lost leader withers before our eyes."